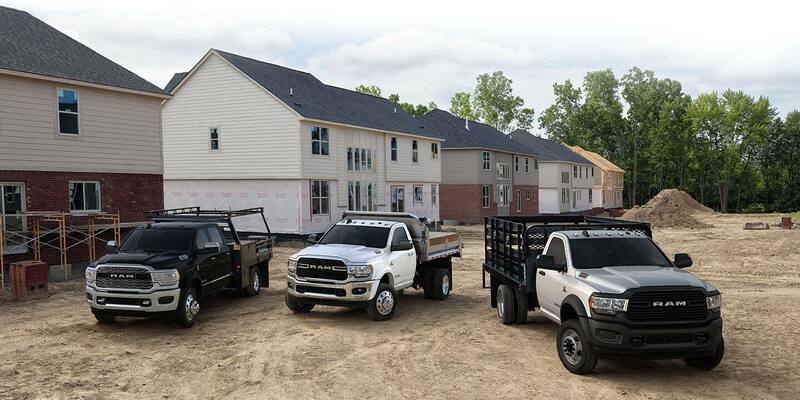 The 2019 Ram 3500 Chassis Cab is built into a new generation of work trucks! This Chassis Cab is leading the segment in capability and never-before-offered technology and comfort that makes it more versatile than ever before! The 3500 Chassis Cab is also one of the most confident, capable, and durable chassis cab truck that Ram has ever created. The truck brand also engineered it to be incredibly upfitter friendly, making it the perfect companion for many businesses and individual handymen! This heavy-hauler is ready to hit the work site to get the job done time after time because it was built for the grueling work day. Learn more about what this Chassis Cab has to offer by reading the rest of our review! How does the RAM Chassis Cab compare to Ford and Chevy? What kind of features does the 3500 Chassis Cab offer? There are four 3500 Chassis Cab trim levels available for the 2019 model year. They include the Tradesman, SLT, Laramie, and Limited -- new for the 2019 model year. The new instrument panel moves controls closer to the driver for ease of access within the cabin. Other great features that stand out include the 12-inch configurable touchscreen with Uconnect 4C NAV with tailor-made Ram graphics. Throughout the trim levels, there are four audio systems available including the outstanding 17-speaker Harman Kardon sound system with an 8-inch subwoofer. The new HVAC system pumps out up to 30% percent more air at a lower noise level so every passenger in the cabin can stay comfortable and continue conversations. It also includes larger front defroster vents for better performance! You'll never have to wait for that windshield to defog in the morning again! Can you tell me about the 3500 Chassis Cab's powertrain options? The standard engine under the 2019 Ram 3500 Chassis Cab is a beast! This 6.4-liter Hemi V8 generates up to 410 horsepower and 429 pound-feet of torque. For the 2019 model year, the 3500 Chassis Cab comes outfitted with Fuel Saver Technology which is cylinder deactivation. This technology shuts off half of the cylinders when they are not needed to help boost the truck's fuel economy. It also comes outfitted with interactive Deceleration Fuel Shut-Off which stops the fuel flow to the cylinders when decelerating also improving fuel economy. For more power, you can opt for a revised Cummins 6.7L inline-6 turbodiesel engine that creates up to 360 horsepower and 800 pound-feet of torque. An eight-speed automatic transmission is the standard transmission option while a six-speed automatic transmission is available. This marks the first time an eight-speed automatic transmission is offered for the 3500 Chassis Cab! Does the 3500 Chassis Cab come outfitted with any safety features? Keeping you safe from work site to work site is an array of passive and active safety features! The 2019 Ram 3500 Chassis Cab is the only truck in the entire segment to even offer safety features. Standard features found in the 3500 Chassis Cab include Automatic Emergency Braking with trailer brakes, Adaptive Cruise Control, and Forward Collision Control. An available, class-exclusive ParkSense Park Assist system uses a 270-degree camera system for audible and visual indications for accurate parking. A class-exclusive cargo-view camera is also available to monitor the payload or upfit in the back of the truck. The new 2019 Chassis Cab can also monitor up to six tires with the Tire Pressure Monitoring System and up to 12 tires on a trailer. If your business is in need of a truck that is so versatile you can do anything, the 2019 Ram 3500 Chassis Cab is the one for you! You can check out even more information about the 3500 Chassis Cab and all that it has to offer in the 2019 model year by heading down to the dealership! You can also reach out to our sales associates over the phone at 855-640-7999!